First Degree PR helped BT Financial Group celebrate its achievements with the publication of its annual Yearbook. 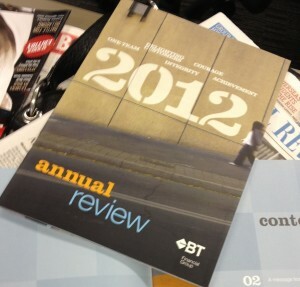 Our team worked closely with the BT communications team to showcase the year’s highlights in a visually appealing way. The end result was a fun and engaging 32-page booklet filled with stories and information sourced from all corners of the business. The six-week project required us to help the team brainstorm a theme, research, write, edit, design, publish and distribute the Yearbook throughout Australia. The final edition was full of stories, interviews, statistics, results, quotes, photos and infographics designed to showcase BT’s successes over the year. To meet sustainability objectives, we contacted key BT stakeholders throughout Australia to see exactly how many copies of the Yearbook they wanted, to ensure an excess amount was not printed. We also agreed with BT that it was more sustainable to print one copy of the Yearbook for every two employees while still giving everyone access to a digital copy. The feedback from BT has been extremely positive. Serving as a useful snapshot of what the culture is like in BT, the publication has also been relevant to external audiences – an interesting case of internal comms being used externally.